Cold temperatures are becoming commonplace for the Colorado Rockies. After opening their home slate with the second-coldest game in club history earlier this month — with the thermometer reading 27 degrees at first pitch — Colorado played its coldest road game ever on Tuesday in Pittsburgh. Snow flurries were in the air at PNC Park, where first pitch was 34 degrees. 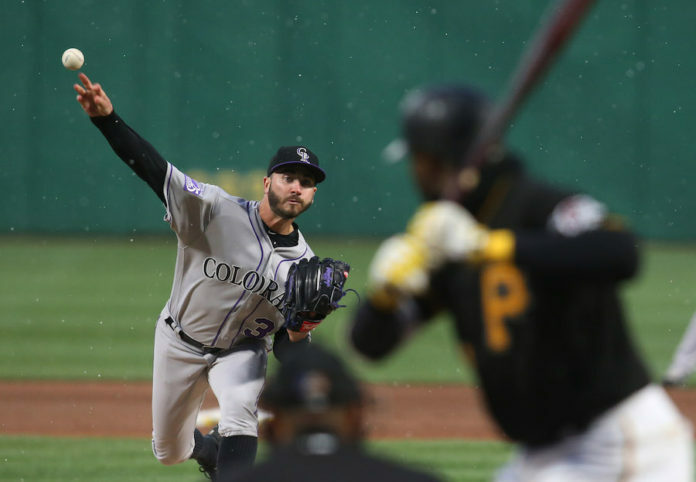 Rockies starter Chad Bettis was in no way fazed by the weather, posting his best outing since a complete-game shutout of San Francisco in September 2016. 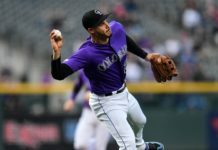 The Rockies posted their first shutout of the 2018 season, defeating Pittsburgh 2-0 and securing their third series win of the year. Colorado has now won three games in a row and seven of their last eight games. Those icy temperatures were almost as cold as the Rockies’ bats. Colorado entered the game with a team .218 batting average — lowest in the National League. The bats didn’t warm much, mustering just five hits in the game, four off starter Trevor Williams. That was all they would need, though. Colorado jumped on the scoreboard early again, plating a run in the first inning. Gerardo Parra took a one-out walk and advanced to third on a Charlie Blackmon single. Carlos Gonzalez drove Parra home on a fielder’s choice. 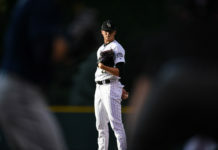 It was the second time in as many nights the Rockies were on the scoreboard before Pittsburgh sent a batter to the plate. Both teams seemed to be in a hurry to get out of the frigid temperatures, as Pirates pitcher Trevor Williams ran into an out trying to advance to second base on a fly-ball out in the third inning. Gonzalez was thrown out trying to steal for the Rockies in the fourth. That out would nearly haunt Colorado later in the inning after Ian Desmond walked and Trevor Story doubled to left field. Ryan McMahon picked up Gonzalez, though, with a base hit through the left side to score Desmond. Bettis did his part to keep things moving quickly in the cold. The right-hander posted his second consecutive quality start, needing just 82 pitches to get through seven innings. Pitch No. 83, however, was a leadoff double in the eighth by Jordy Mercer — the only player in the game to record multiple hits. Bettis (3-0, 1.44) exited after a pinch-hit groundout by Adam Frazier moved Mercer to third. Bryan Shaw fell behind Sean Rodriguez 3-1 in relief of Bettis, but forced a soft ground ball to third base, which McMahon fired to Tony Wolters at home to cut down Mercer. Jake McGee produced an infield fly to end the eighth. The book on Bettis closed with 7.1 scoreless innings pitched, five hits, two walks and three strikeouts. In his ninth appearance of the season, Wade Davis earned his NL-best eighth save. Davis retired the side in order. Colorado is now 11-8 on the season, 9-4 on the road. The Rockies have played more road games than any other team in baseball to this point in the season. At the conclusion of the game Colorado was the only MLB team with a winning record and a negative run differential (-4). UP NEXT: Colorado and Pittsburgh wrap up their three-game series with an afternoon affair, with temperatures expected to be in the 50s. Kyle Freeland (0-2, 4.50) faces Chad Kuhl (1-1, 5.71). The game will close a 17-day stretch with no off days for Colorado. The Rockies have Thursday off before returning to Coors Field for a three-game series with the Cubs.